Mookie Betts believes he is ready to return to the Red Sox lineup Thursday night versus Houston. "I'll come in and it should be OK," Betts said Wednesday night. "I should be able to go tomorrow." Betts was removed from the game Monday night after a swing forced him to get his wrist medically examined by a hand specialist. 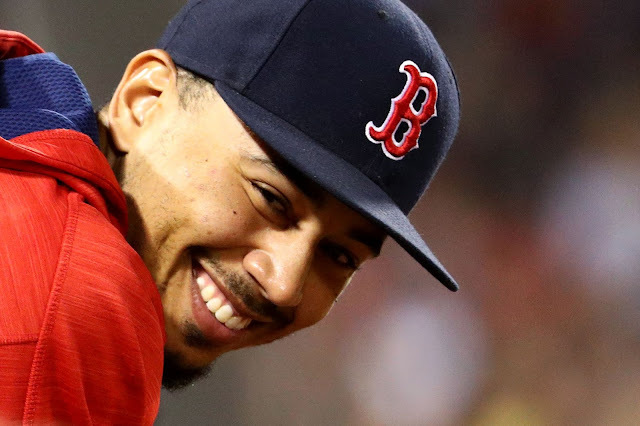 Mookie proceeded to miss the final two games of the Toronto series. However it appeared Betts could have pinched hit if needed last night, a sign he is ready to go. "It felt good today. It felt a lot better," Betts said. "Got some treatment on it and whatnot. Just have to come in and get it back going again." He added, "I should be OK for tomorrow, but I still want to come in and make sure everything is good before we go back out there." Before the bruise to his thumb and wrist inflammation, Betts was carrying one of the hottest Red Sox bats. In the last 14 days, Betts has hit .302 with two homers and 13 RBIs. The 13 RBIs have bumped him over 100 total for the second straight year. The Red Sox need a healthy Mookie Betts in the lineup to help close out the AL East race and if they plan on making any sort of run in the playoffs.